It's Nuclear Regulation Authority's turn to be bullish on nuclear power plants in Japan awaiting NRA's approval to restart, now that the Tokyo gubernatorial election ended with the result interpreted as great endorsement of Prime Minister Abe's policies across the board. NRA accepted the conclusion of the experts that the fractured zones inside the Ooi Nuclear Power Plant compound are not active faults. All set to restart, then. NRA accepted the report that fractured zones at Ooi Nuclear Power Plant are not "active faults"
Fractured zones inside KEPCO's Ooi Nuclear Power Plant (Ooi-cho, Fukui Prefecture) compound have been suspected to be active faults. However, on February 12, 2014, Nuclear Regulation Authority accepted the report by a group of experts whose conclusion is that "they are not faults that may become active in the future". 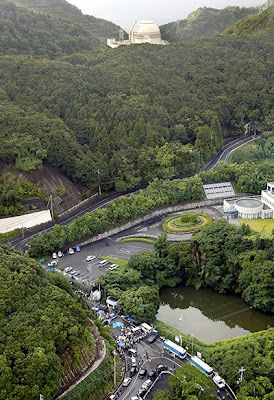 Ooi Nuclear Power Plant in Fukui Prefecture is accessible through a tunnel. In a severe accident after a big earthquake and tsunami, the only way to access the plant is by boat, if the tunnel collapses. Even then, if the plant harbor is destroyed by tsunami, oh well. It is not supposed to happen, and therefore it won't happen. The experts investigating on behalf of NRA did two surveys of the site to determine whether the fractured zones were active faults. The first survey was inconclusive, with most experts saying they were active faults. Clearly that changed in the second survey. In case of a severe accident, the emergency response headquarters at Ooi Nuclear Power Plant will be a small spare room next to the central control room. There was no objection at all from NRA to this arrangement. Again, the Tokyo gubernatorial election was supposed to be a mere provincial election (which was not, as revealed after the election by the compliant media), and the nuclear issues were supposed to be of little significance (which were total opposite, as revealed after the election by the compliant media). There's no stopping the Abe administration now.
" .. if the plant harbor is destroyed by tsunami, oh well. It is not supposed to happen, and therefore it won't happen." Ok, then let the lawyers follow suit. Have them find the exact language that removes liability from the NRA and do the groundwork now to make that liability stick. During the shogunate era the people were forbidden to possess weapons, hopefully that's not a culture that was taught to override common sense. If that tsunami does occur will the people be again weaponless? Or your other option is to submit to a banana republic where the legal profession is forever threatened by death squads? Banana republic? Oh yes, Japan is an ally of the US, the biggest banana republic on earth. Very good, 12:41, Japan & America similarly "entitled", both Banana Republics, and curiously fixated on keeping their populations disarmed while pointing guns in their own populations' faces and the faces of others. And just so we're all on the same page here. The Game for Retards where Western corporations clamor and elbow their way into China for their rock-bottom wages and environmental anything-goes, where the corporations were assisted in gutting their own countries' economies, where no one believes it was about "communism" but rather about filling their own pockets .. at YOUR expense, and now is time to sacrifice the lives of your sons and your's as well, as they insist that you can't possibly see that forest for those trees. As if it was essentially You that was retarded, and not They.